One of the many things that makes the Back to the Future trilogy great is how tight the story is. There’s a beginning, middle, end and though the story weaves in and out of those moments, it’s incredibly self-contained. Which is why the idea of a Back to the Future comic book sounds so weird. A Back to the Future comic book would have to happen without additional time travel, because that would rewrite the events of the movies. How do you do Back to the Future without time travel? You can’t have the characters using the Delorean in crazy ways that undermines the drama of the main story, so what then? According to producer Bob Gale, the upcoming comic, which will be released in October by IDW, will fill in gaps within the trilogy. Like what? Well, the first issue will explain how Doc and Marty met. The second issue will explore Doc working on the Manhattan Project. From there, we don’t know. 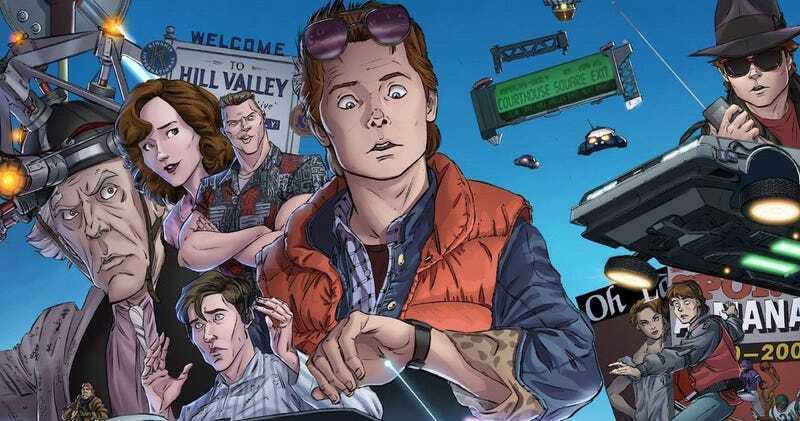 But here are 10 ideas we’d love to see, and hate to see, in the new Back to the Future comic. 1) Young Marty sets the rug on fire - One of the weirdest lines in all of Back to the Future is when Marty warns his parents about his younger self setting the rug on fire. I’ve always wondered, what happened 20 years later when this super-specific, self-fulfilling prophecy took place? Did George and Lorraine freak out? 2) The story of Biff’s rise in alternate 1985 - We saw a little bit of it in the Part II montage, but anything that has to do with Biff Tannen cheating his way to becoming America’s richest man in the alternate 1985 would be a sleazy delight. 3) Doc’s first visit to 2015 and Marty’s kids - The reason Marty has to go “Back to the Future” in the second film is his son, Marty Jr. gets arrested and then his sister tries and fails to break him out of jail. That sounds like an incredibly dramatic and ripe story to be told. 4) Mad Dog Tannen kills Doc Brown - We know Mad Dog Tannen killed Doc in the old West over a matter of $80. Doc being our hero, wouldn’t it be cool to actually see him get killed? Where it happened, the reaction, etc.? Morbid yes, but fascinating, especially since we know Marty will come back and change that. 5) Marty meets Jennifer - At the beginning of Back to the Future, we are just meant to buy into Marty and Jennifer’s relationship, and that continues throughout the trilogy. But how did they meet? How did Marty pick her up? Did Jennifer make the first move? The beginnings of this life long love story would probably be sweet. 6) The rise of the Stricklands - We know from the films that the Strickland family has been keeping the peace in Hill Valley for 100 years. There have got to be some stories there, either back in 1885 or all the way up to 1985 when Gerald works at the high school. 7) Uncle Jail Bird Joey’s story - Lorraine’s brother, Joey, is in prison throughout Back to the Future and famously doesn’t get paroled at one point. What did he do that was so bad? Why did he miss parole? He’s a very intriguing character to say that least. 8) Doc discovers the Flux Capacitor - Doc’s told the story, we even met him moments later, but we’ve never actually see Doc fall down and discover the Flux Capacitor. A comic book could uniquely show us what happened in his mind, him madly running to write it down, what he said to himself as it happened, all that good stuff. 9) Marty getting good at Wild Gunman - There are multiple moments in the films where Marty’s ability to shoot, thanks to the game Wild Gunman, comes in handy. Granted, this may belong on the second half of this list, but I personally would like to see how much Marty played the game, where, with who and more. 10) The Star Wars alternate version - A few years back, Dark Horse released a comic called The Star Wars which told the story of Star Wars from George Lucas’ original, radically different, script. Back to the Future has one of those too, where the time machine was a refrigerator. That would be fun to see reimagined. 1) Anything after Back to the Future Part III - There’s always discussion of what a Back to the Future Part IV would be, but any mention of Doc Brown flying around in a time traveling train with his family would wholly undermine the wonderful drama of the first films. Ditto for finding out what Marty grew up to be. We never need to know. 2) Doc builds his breakfast machine - The machine that opens the first Back to the Future, basically a huge contraption to make breakfast for Doc and his dog Einstein, is incredibly cool. But it would be incredibly stupid to watch him build it. 3) Peeping Tom George McFly - We know that George met Lorraine because he was watching her undress from a tree. You could tell a very creepy, disturbing story with George to see how deep his voyeurism went. But we’d rather they didn’t. 4) Western Union gambling - Doc Brown left Marty a letter in 1885 to be delivered in 1955 and when the Western Union guy delivers it, he says it’s been a huge topic of discussion at the company for a while. They’ve even made bets. That would be a dumb thing to see. 5) Doc Brown and his pinball machines - In 1985, Doc Brown sold the Libyan terrorists he was working for a bomb full of old pinball machine parts so he could keep the Plutonium to start the Delorean. Where the hell the Doc get all these pinball machine parts? Did he go shopping? Did he always have them? This is a story that doesn’t need to be told. 6) Marty’s “chicken” complex - Why the hell is Marty McFly so against people calling him “Chicken?” Who cares what they think and “chicken” is pretty tame when you look at the gamut of insults. An explanation of this would be inane and likely infuriating. 7) Anything 2015 Marty - While the story of his kids would be super cool, 2015 Marty is a loser. He’s got a bad job, he’s been bullied by Needles and generally beaten by life. Any more information on him would likely be ultra depressing. 8) The Pinheads perform - Marty McFly’s band, the Pinheads, were too loud to play the school dance. But they’d obviously been performing before and Marty was a solid musician. Where else did they perform? Who were the other guys in the band? Do we care? Of course not. 9) George McFly runs for School President - After knocking out Biff in the alternate 1955, George McFly is told he should run for School President. We don’t know if he did or not, but he could have, and a political drama at 1955 Hill Valley High would be hilariously bad. 10) Doc buys a Delorean - This is the ultimate “We don’t need it, but you could tell it” story. It’s just Doc Brown goes car shopping with the salesman at various dealer ships not knowing his true intentions and it ends with him settling on the Delorean.